There is a lot of beauty to be found throughout Pandora, from creatures to culture. This is especially true if you’re looking through the lens of nature reclaiming created environments, a key message found throughout Disney’s Animal Kingdom. The lab section of Flight of Passage explores many different facets of the educational components of the park, including conservation, reintroduction, and natural restoration. There is even an experiment that looks at invasive, non-native species introduction to Pandora. Known as the Velocivirus, it is part of the Pandora Conservation Initiative's Invasive Species Study. 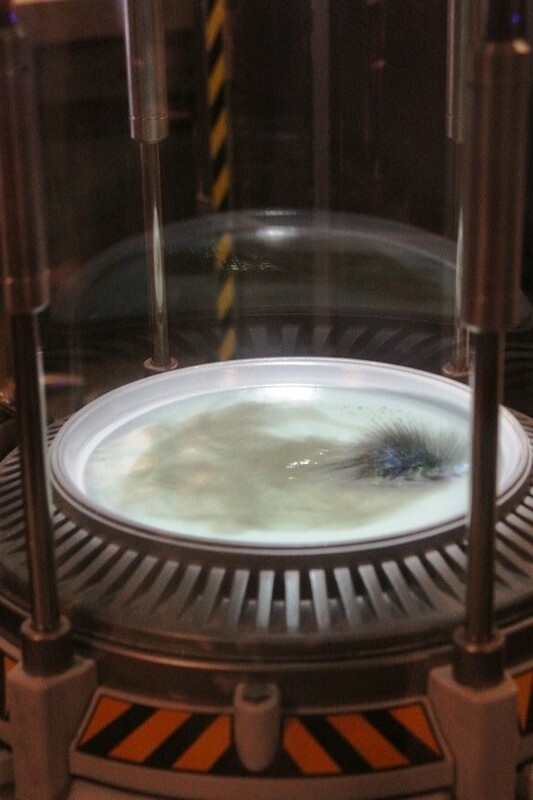 It is kept in an active quarantine bubble, so while this spiny, inky black blob is able to move around on a large, futuristic Petri dish-like surface, it isn’t going to be able to run rampant around the moon. It is a strange bug, I’ll grant you. It uses micro-vibrations as a form of echolocation and to move about, it latches on to healthy tissue and, like a hemorrhagic virus, it attempts to dissolve the tissue it finds. The colonial-cooperative virus has a whole new environment with which to wreak havoc, and the researchers at the Pandora Conservation Initiative have yet to find a way to eradicate the virus. It is worth noting that the small sample visible in the lab is far from the only specimen around. The Velocivirus reached Pandora by hitching a ride on one of the various spacecraft that have made their way to the moon, specifically near the exhaust areas of the vehicles. To ensure the invasive species doesn’t make landfall, the ships are supposed to fire their thrusters prior to entering the atmosphere. As that requires burning up a lot of fuel, and fuel costs money, you can see why some less conscientious, penny-pinching individuals could maybe forget to follow procedure. This is similar to how we ended up with pythons, Cuban tree frogs, green and black spinytail iguanas, or kudzu as just a few of the invasive species to be found in Florida alone. Humans tend to be the link in how these invasive species are introduced into non-native environments, through a desire to bring something new with them, carelessness, or indifference to the harm they could be causing. Luckily, there are also humans on Earth, as well as on Pandora, who are always looking for ways to make things better. Education is a critical function of any conservation effort, and the Velocivirus an allegory for many of the problems we face on our own planet, some of which are chronicled in other sections of Disney's Animal Kingdom. Of course, all you have to do is look across the lab to see efforts to reintroduce and protect endangered species. Kudos are to be given to Joe Rohde for how much attention to detail and storytelling that he shares, which turned us on to this little story to begin with.